Review in a Nutshell: King of Scars absolutely blew me away. It was everything I wanted and more, and I don’t think I’ll be able to function normally until I can read the next book! “Everyone mourns the first blossom. 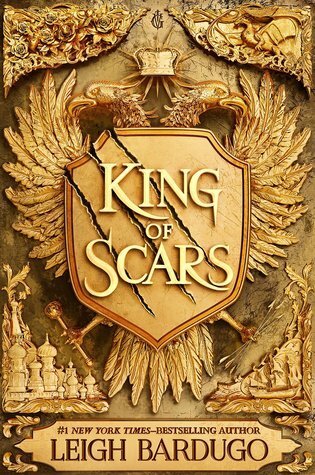 King of Scars is the first book in a new GrishaVerse duology, following Nikolai Lantsov, the King of Ravka, his general, Zoya Nazyalenski, and a soldier in his army, Nina Zenik. This is the most I can say without spoiling any other GrishaVerse books, however beyond this point I’m going to stop caring about spoilers for the Six of Crows Duology and The Grisha Trilogy. If you haven’t read those books– READ THEM! Not only are the amazing, but they are definitely required reading for King of Scars. There is so much going on in this book, and you really should read the first five books in this universe (and probably The Language of Thorns too because why not), otherwise it may get a bit confusing, and some of the emotional moments may not hit quite as hard as they would if you knew the full context. While it *technically* isn’t mandatory, it really should be. Leigh Bardugo has definitely earned her title of queen of YA fantasy. Her writing style is gorgeous, with elegant proseand so many beautiful, quotable lines, while also having so many funny and snarky lines that I absolutely adored. She manages to both tug on your heartstrings and make you laugh. Although, perhaps that may not be the best way to describe the emotional rollercoaster this book is. She steps on your heart with 5-inch stilettos and still has you eager to start the next chapter. There is quite a bit happening in this book. With 2-3 plotlines going on at any given time, there is always something exciting happening in someone’s point of view. The beginning can be a little slow, as you’re seeing this world again for the first time in years and a reintroduction is in order, but once the pace picks up, it never slows again. This book is filled with political maneuvering, spying, deception, and epic action. I love these characters more than anything. Most of the characters are familiar faces, seen in previous books (which is why it’s so important to read those), but there are also a good amount of new characters that will steal your heart.Isaak became a favorite of mine after just one chapter. Yuri was another character that captured my attention. Seeing him interact with the main characters who lived through Ravka’s civil war was always fascinating. Hanne was another new character, and I can’t wait to see more of her! As for the old friends we all know and love– this book made me love them all even more. Nikolai is just as amazing as always. I wish Leigh would just let him be happy for once in his life, but apparently, that’s not allowed. It was so great learning more about Zoya and her history and seeing her and Nikolai interact never failed to make me smile. Meanwhile, every Nina chapter broke my heart more and more. That said, her development in this book is handled so well, and while some scenes with her made me sob, I love her so much. Most of the side characters from The Grisha Trilogy also show their faces in this book, and I loved hearing how they’re doing and where they ended up. I only wished we got to see some specific characters I loved, but hearing their names mentioned was good enough for me! King of Scars is amazing. It is captivating, thrilling, heartbreaking, immersive, and every other adjective I can think of. You’ll be seeing this in everyone’s “Favorite 2019 Releases” at the end of the year (I know it’ll be on mine). ARGH I have to read this book – it’s on the top of my TBR!! Great review!